Last year local Goodwill® organizations collectively provided job-training and employment services to more than 235,000 older workers – age 55 and over. As the saying goes, “Age is nothing but a number” and the wealth of knowledge and experience that these individuals bring to an employer is an asset. Each year during the last full week in September, the US Department of Labor (DOL) and the workforce development community celebrates older workers by marketing their value and their contribution to the workforce in the past, the present, and the future. 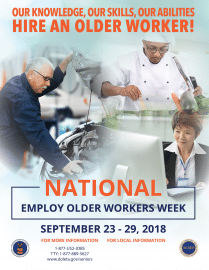 National Employ Older Workers Week (NEOWW), September 23– 29, 2018, is about acknowledging and promoting the value of older workers across our nation. The week also showcases DOL’s Senior Community Service Employment Program (SCSEP), an on-the-job training and employment program designed to help those aged 55 and older update their jobs skills, build work experience and confidence, and continue to have economic security and well-being. This year’s NEOWW theme perfectly matches the message we deliver to employers in our role as national SCSEP providers. Local Goodwill organizations help seniors find work, develop new skills and talents, and build their financial security through SCSEP. The local program has supported individuals like Gail Rutledge. Rutledge, 65, thought she was too old to train for a job, but she needed to find work. At the end of most months, she had as little as $10 left after paying bills. In March, she enrolled in SCSEP and is training as a resource navigator at a retail store run by Evansville Goodwill Industries, Inc. (Indiana). She’s learning customer service and computer skills. Since joining SCSEP, Rutledge is catching up on bills. She bought new glasses and hopes to buy a car. “It’s a dream I would never have made for myself,” Rutledge said. Glover, 57, was unemployed about three years before coming to SCSEP. He felt his skills deteriorated while he was off work because of a disability. Now, he’s getting experience as a clerical aide at the Kentucky Career Center. As we celebrate NEOWW, you can help us share the value of this important program. Share your story with us! If you’re an older worker yourself or an employer who has hired an older worker through SCSEP, share the contributions that this valuable population has made.